The company I work for is hosting a "Show Yourself Some Love" weight loss challenge, which began last week. If you lose 5 lbs. and keep it off until April 1st, your name is entered into a drawing for prizes. Since swimsuit season will be here before we know it, so I decided this was just the push I needed to lose a few pounds and to get my body moving. Those of us that signed up to participate received these litte jars. 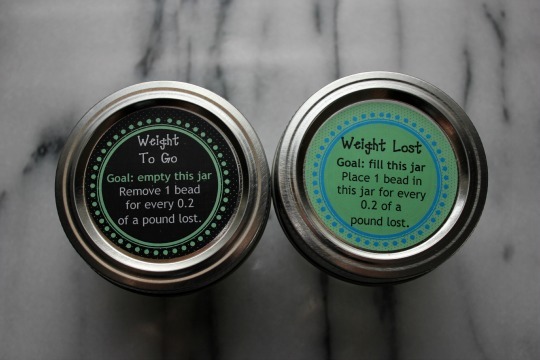 For every 0.2 pounds you lose, you get to remove a bead from one jar to the other. I keep them on my desk at work to motivate me NOT to snack on the wrong foods. I've been really good so far, but I still haven't been able to move a bead. I am doing Weight Watchers on my own since it has worked for me in the past. Now the challenge is staying within my 26 points plus each day!! Fruits and veggies are zero points, which I love, but I was trying to come up with a few other low point snacks to have in my lunch bag at work. 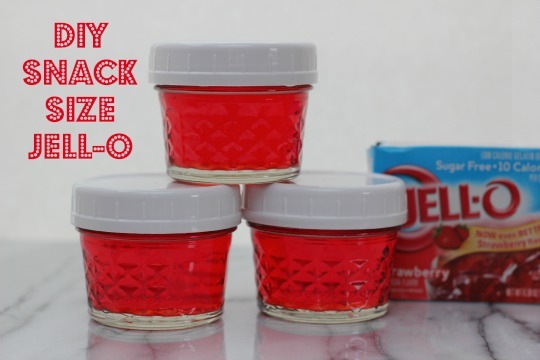 Sugar-Free Jell-O is 0 points, so I decided to make my own instead of buying the snack size 4 pack for $1.99. A small box of Sugar-Free Jell-O is .74 cents at Target and all you need to add is water. I made the Jell-O and poured it into 4 ounce jelly jars that I already had on hand. One small box of Jell-O filled 6 jars. Definitely more economical as long as you already have the containers and eco-friendly! Any ideas for me of other low-point snacks or food? I'd love to hear your weight loss tips or sucess stories, so feel free to comment! Empty Jell-O into a small bowl. Pour 1 cup of boiling water of the Jell-O and stir for 2 minutes. Add 1 cup of cold water and stir to combine.